Kenix wins 7th place among the Top Ten TVB Actresses conducted by the I Weekly Magazine in Singapore. i'm happy, & kinda surprised, that she still wins a place in this poll after a year hiatus. Anyway, congrats to our beloved Kenix for she's still loved by many. Kenix Kwok wore an elegant black dress to take part in the press conference for her sponsors Vagheggi slimming, showing off her shoulder and beautiful figure for the media. To mark the brand's eighth anniversary, a cake was presented for Kenix and company executives to blow out the candles. She was so excited and happy, it seemed like it was actually her birthday. Kenix has been relaxing recently as she takes her time in selecting her next project. credits to Em for the translation. Kenix's birthday is coming up, actually. She does look pretty, but not as gorgeous as the event from yesterday (below). She wore 2 black dresses 2 days in a row. They're elegant & classy though. 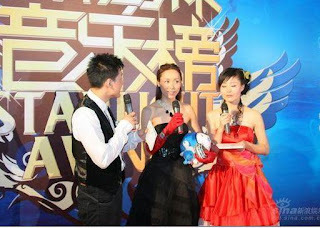 The 5th South-East Music Chart Awards at Fuzhou's Fujian was held in grandeur on the night of 10th November 2007. Angela Zhang, Fish (Jasmine) Leung, Jeff Chang, Ah Du, Victor Wong, Penny Tai, Mayday, 183 Club, 5566, Peter Ho, Evan Yo and several more singers were present at this event. Every celebrity in their glamorous attire strolled down the red carpet to enter the venue of the event, each with their unique makeover. Every celebrity autographed on the lucky charm (a soft toy) and also penned down their wishes. The awards ceremony began at 7:30pm sharp, the event was segmented into five parts: the beginning, the maturing, the transformation, the gains, the touching. At each segment, after revealing the results for each award, popular singers will perform a song: Jeff Chang, Angela Zhang, Fish Leung, Penny Tai all entertained the crowd with their respective song. Mayday, 5566, 183 Club, Korean artist Lee Jung Hyun, Nam Hyun Joon, also performed dance and sang for the crowd. TVB fa dans Nadia Chan, Kenix Kwok, Sheren Tang, Michelle Ye, Monica Chan were also present to give away awards. Ray Ma and Li Na both won Mainland's most popular male / female singers award respectively while best male / female singer awards went to Pang Lung and Jing Sha. Wu Ke Qun and Angela Zhang became Hong Kong's most popular male / female singers, while Jeff Chang and Fish Leung were the most explosive male / female singers. Vision was the year's most voted singer. The event will be re-played on 11th November at 19:35pm. Kenix looks absolutely stunning in the pictures. i wonder if she has met up with old friend Monica Chan for a chat? it's been a long time since i last saw her with a friend.